More than 200 Rohingyan asylum seekers are dead, and thousands more are at risk, as asylum boats are turned back to sea between Indonesia and Malaysia. The reality has been shockingly brutal. One boat finally rescued by Indonesian fishers had been sent away by the Thai navy on three occasions and twice by Malaysia. The second time they were rebuffed by Malaysian authorities, they were held at gunpoint and told that their ship would be bombed if they did not turn around. Abbott has set the example. 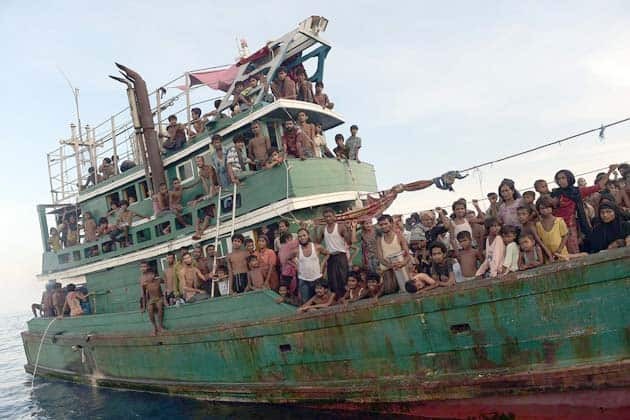 Under Operation Sovereign Borders, the Coalition runs a naval blockade between Australia and Indonesia, intercepts asylum boats, holds asylum seekers captive, and condemns asylum seekers to the hell-holes of Nauru and Manus Island. The poison of Abbott’s turnback policy has spread to Thailand, Malaysia, and Indonesia. His encouragement of turnbacks has endangered thousands of lives. Abbott says turning boats back save lives—it’s a lie. Turning boats back has only ever meant that asylum seekers are condemned to die somewhere else. But even when asylum seekers are obviously at risk of dying so close to Australia, Abbott won’t lift a finger to help. Not a boat; not a plane, not a food drop, nothing. Over 1000 asylum seekers have landed on Malaysia’s Langkawi Island. Nearly 3000 have been rescued by Indonesian fishers in Aceh. The plight of the Rohingya, a Muslim minority in Burma, is well known. But both Labor and Liberal governments have turned a blind eye to the mass killings and ethnic cleansing by the Burmese government. The most recent phase began in 2012. Over 125,000 were driven from their homes; mosques were destroyed and whole villages razed. In just one month in October 2014, 16,000 Rohingya fled. Those attempting to flee into Bangladesh are often forced back by armed guards. The Abbott government has compounded the persecution by cutting off any legal pathways to Australia. Refugees in Indonesia are denied resettlement in Australia and there is a de facto ban on accepting Rohingya refugees from Malaysia. Abbott was also keen to offer advice to the European governments in the wake of the refugee crisis in the Mediterranean, “The only way you can stop the deaths is in fact to stop the boats,” Abbott said. Labor’s Immigration spokesperson, Richard Marles, has been pathetic. He has made comments about Abbott not being a statesperson; but he hasn’t called for a rescue operation. And he hasn’t called for the Rohingyans to be brought to Australia. When asked about the crisis in the Mediterranean, Marles just seized the opportunity to argue that Europe need offshore processing. Stopping the boats would not work in the Mediterranean, he said, because there is no equivalent of Nauru or Manus Island. Presumably he would be happy with emerging European suggestions to set up processing centres in places like Libya, Niger, Egypt, Turkey or Lebanon. While Thailand, Indonesia and Malaysia mounted naval blockades and pushed boats back to sea—and Australia egged them on—to its credit, the Philippines government declared its willingness to take the thousands of boat people. It is not a practical solution—the boats would never get there—but from such a poor country, it dramatically exposed Abbott’s inhumanity. Abbott has bragged about the amount of aid Australia gave to Indonesia when the earthquake hit Aceh in 2004. But now the lives that are at risk are those of asylum seekers, they mean nothing to him. The brutal reality of shutting borders to asylum seekers is now being dramatically played out across South-East Asia. If that brutal reality is going to be stopped we have to argue to open the borders and rescue the Rohingya. Nothing less will do. As Solidarity goes to press, news is breaking that Indonesia and Malaysia have agreed to provide temporary safe haven to the Rohingyan asylum seekers on condition “the international community will take responsibility for the repatriation of the irregular migrants to their countries of origin or resettlement to third countries within … one year”. But don’t expect anything from Abbott. The fight to close Manus and Nauru and to resettle the Rohingya go hand in hand. Nope nope, nope Abbott is a dope. And A Callous Heartless One at That.